The world's first space tourist, Dennis Tito, isn't done with space. The American entrepreneur has founded a new nonprofit organization to work toward launching the first manned mission to Mars in 2018. The flyby mission, which wouldn't land on the Red Planet, would take advantage of a rare planetary alignment that would allow a speedy trajectory to Mars and back in about 500 days. 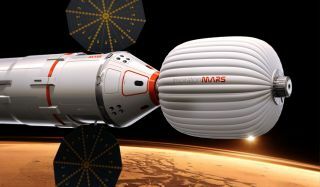 Tito unveiled the mission today (Feb. 27) at the National Press Club in Washington during the launch of the new nonprofit Inspiration Mars Foundation, which will oversee the audacious project. SPACE.com caught up with Tito to ask him some burning questions about the new private Mars mission. SPACE.com: Would you consider going on this mission yourself? SPACE.com: So who do you think would make good candidates? Tito: We're proposing a man and a woman, because this is humanity's first flight out to Mars, and humanity should be represented by both genders. We hope that we can find a married couple. When you're out that far and the Earth is a tiny blue pinpoint, you're going to need someone you can hug. What better solution to the psychological problems you're going to encounter with that isolation? Tito: Over 600,000 people have applied over the prior 40 years to be astronauts, so I'm sure there will be a lot of applications for this mission. You really have to select the best qualified people. SPACE.com: What do you think theconditions will be like for the crew? Tito: There are cramped quarters for the crew. It's a Spartan mission. It's a bold mission. What we're doing is adding significant embellishments to the spacecraft so that it's capable of sustaining two people for 500 days. We have a lot of work to do. But we'd use existing launch vehicles and we have several ideas about that, we're talking to industry about that. SPACE.com: Have you decided yet whether you'll use SpaceX's Dragon capsule and Falcon Heavy rocket for the mission? Tito: We used SpaceX as a reference in our study, but there's a lot we don't know about whether Dragon's going to be selected by NASA as a commercial crew vehicle. Falcon heavy hasn't been launched yet. There are a lot of unknowns. We don't want to put all our eggs in one basket. SPACE.com: What is the scientific value of a manned mission to Mars, if the crew won't be landing on the planet? Tito: At first, I thought this is not a science mission. This is for inspiration; it's a test flight to show we can get there. You're going to learn a lot about the engineering problems. But then as I started learning more about the life sciences, apparently [the benefits] are huge. There hasn't been really any information on human behavior in this kind of environment. The impact of radiation, the isolation — the academics are all very excited. It'd be a huge scientific valuein the life sciences. SPACE.com: But you're really aiming for inspiration? Tito: My younger years were during the Apollo missions. The '60s for me were just really exciting times. It had a whole impact on my generation. I know the space program caused me to get my engineering degree. But what happened to the interests of this generation in science? It's really on a decline. And I think if we have this first mission to Mars, even though it's far from our goal of landing, I could see it jumpstarting interest in space. I could see the potential of recreating what existed 50 years ago during the space race. I think it will be a big step in America'sleadership role in the world. SPACE.com: Is NASA involved in this mission? Tito: We just signed a Space Act Agreement with them for at least one of the critical path areas. Rather than NASA funding us, we're funding NASA. That showed us that they're really willing to endorse the idea of public-private partnerships. They're not endorsing this mission, at this point, but they're certainly open to the idea of helping us with the technology, because that technology is going to benefit them. SPACE.com: How likely is it that you'll actually be able to launch this mission in 2018? Tito: I give it a good chance. We're seeing a lot of positive response from people. I can't make it happen by myself. It isn't like I can just write a check for the whole thing, or force the engineering to come out the way I want it to. But unless we run into showstoppers, I don't see why not. We can do this if we want to. I can't tell you how excited I am. It's hard to sleep at night. My gut feeling is, we're going to make it.